When the preschool Elf on the Shelf says a special guest is coming to town, you'd better watch out. And probably skip the crying and pouting, just to be on the safe side. 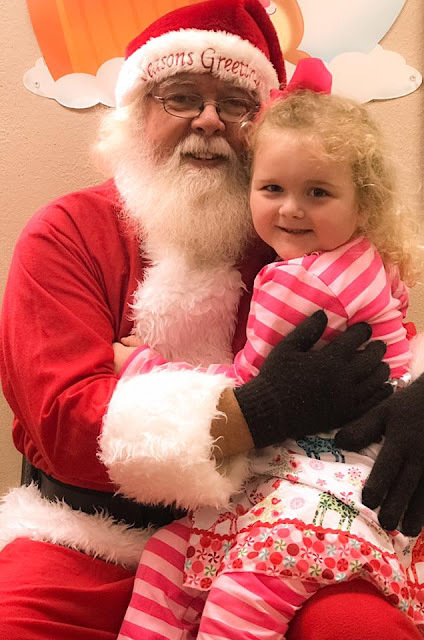 Nora politely denied a chance to see Mall Santa this year. Even though she wants to tell him about her wish list and her reduction in sibling brawls, she'd rather not engage in such a public display of Christmas joy. That's why I was nervous when I heard the Big Guy himself was coming to Nora's school. Her teacher asked us to keep it a secret, so I did. Barely. Twinkle Toes, Elf on the Shelf in residence, was holding a letter when the kids arrived Thursday morning. Twinkle Toes is also getting ready to head back to the North Pole with his report. Nora thinks she's good to go, but she's worried about a few of her classmates. Nora told me the daycare's name was on the front of his envelope, so they knew it was official. He did not have reindeer, he had a white car. Driven by elves, apparently. "Ho Ho Ho" was not how he greeted them, so he may have been a phony. His beard was fluffy, though, so he could have been the real deal. Nora told him she wanted a big, pink Hatchimal and a new bike. Both of these requests were news to me. The girl who went before her also wanted a big, pink Hatchimal, so he said he'll make two at the same time. No one but the baby cried on his lap, which is a huge deal in a class of three- and four-year-olds. He had a stocking full of candy canes and gave her one. Nora said she hopes he empties it quickly so he can fill it up with presents for himself. He was very sweet and cute and gave Nora a big hug. And he was strong enough to pick her up by himself. She already has plans to set up special ops to see him on Christmas.. just to make sure this guy was legit. Were your kids willing to sit with Santa Claus this year?